This card took a while to make, but I love the finished result! The base card is green, I added a layer of red card to strengthen the design. I stamped some vintage Merry Christmas text in white at the base of the card. 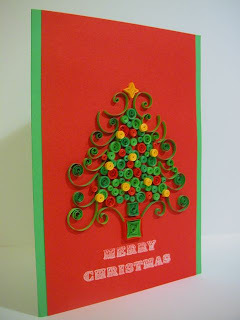 I made a series of different sized quilled coil shapes (open and closed) in two shades of green, red and yellow. 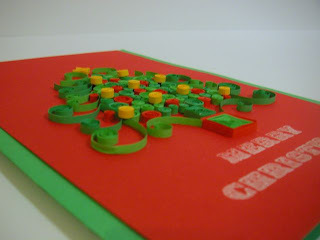 I made a yellow star shape for the top of the tree and two green squares for the base. I then made a series of scrolls and double scrolls in two shades of green. Everything is on one layer apart from the yellow coils, I added them on top when I finished assembling the tree. It took a while of just moving things around to get it looking right, I started with all of the centre coils then added all the scrolls to the edge. Time consuming but makes a special card!